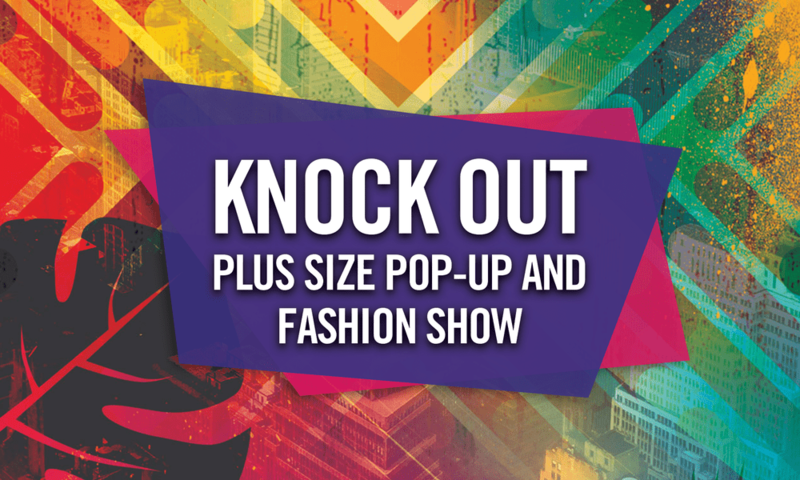 The 2nd Annual Knockout Portland plus size fashion show & pop-up shop just ended and we’ve got exclusives with the designers behind those amazing fashions! 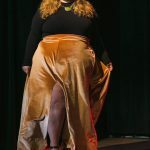 Just over a week ago, a few hundred plus-size and fat fashionistas gathered in Portland for the annual plus size pop-up and indie fashion show, Knockout. 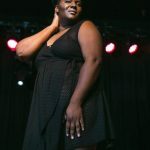 The event also featured a pop-up show, with plus-size and fat-owned businesses from around the USA. Anna O’Brien was the keynote speaker and Jes Baker, the emcee. 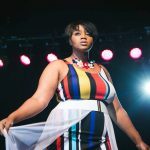 The fashion show featured fall collections from 6 amazing indie plus size designers, and we sat down with a few of them to discuss their work. BH: Where do you get your inspiration? CD: When designing a collection for Copper Union, my inspiration is always the fabrics. I studied Fiber Arts at the Portland Fashion Institute, so the fabric is very important to me when designing a collection. 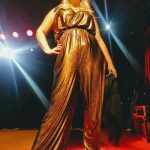 CD: Isn’t that jumpsuit great? For every show, I make each garment to the model size so that it fits perfectly. Most of the pieces will be available for purchase in the upcoming weeks. It will be a very small run some styles will only have two or three made of each, but others will be more readily available. BH: What did you most enjoy about showing at Knockout? Knockout is my passion project! 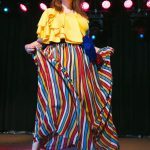 I love being able to show new and exciting pieces to in the audience that is majority plus size. It’s a safe space where I can play with different choices of fabrics and silhouettes. 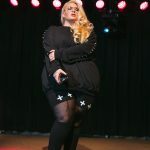 Also, I am so proud to help build the body positive community and support creators – it always makes me so proud to see everyone’s beautiful designs on the runway and for sale. 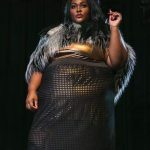 BH: You own ReDress (a Cleveland-based store for plus-size and fat folks) AND you’re also a designer. Your collection, PRIMARY, is very fashion forward. Where did your inspiration come from? RK: I just wanted to do something bold that was a departure from my usual at Re/Dress. I found the striped fabric through one of my distributors in LA and thought it was the perfect basis for a collection. It looks like a Hot Dog on a Stick uniform! BH: You designed some of the prints for this collection, so I’m betting that they’re limited edition. AND, I saw people (including me, haha) who walked away with multiple pieces from PRIMARY. Will the rest of the world be able to order these pieces? I made 2 pieces in each size of the collection, which is 1x-4x but I can also have a 5x made. I’ll be selling the remainder of the pieces that I didn’t sell in PDX starting today, and if there’s a demand for more, I’ll make more. Some of the items that were limited edition fabrics, there were only two of and that’s it! BH: What was your favorite part of showing at Knockout? I loved being with my community. It was so thrilling to be in a room of fat people and get to put on a show that they enjoyed. Every time there were cheers and applause for one of my models coming out on the runway, I got goosebumps. BH: Bombsheller has an assortment of styles – how in the world did you select what to put on the runway? EA: The pieces that we picked for the fashion show were selected because we wanted variety – we wanted to make sure that we had both dark and sleek designs as well as bold patterns. Some of the Bombsheller pieces that were on the runway were collaborations with Ashley Joncas and Valerie Sagun of Big Gal Yoga. BH: The size diversity at Knockout was incredible. How did you make sure to fit all the models, when you’re headquartered in Seattle? EA: Printing on demand is a major part of our business model, which means we have almost no back stock so printed leggings never go to waste. 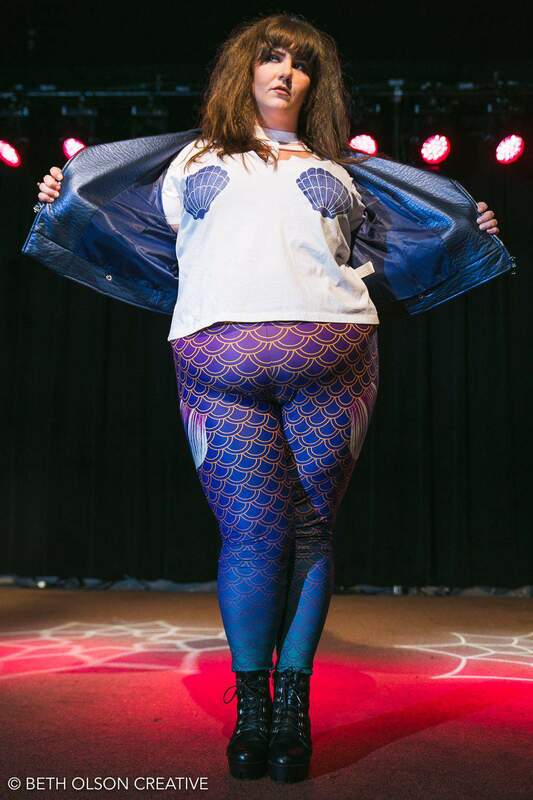 We didn’t custom fit the leggings to the models, but we printed the pairs that they wore specifically for this event using the templates that we built after many beta tests and fitting parties with people of all sizes. None of the designs were exclusive to Knockout – they will all continue to be available in our catalog! BH: What was your favorite part of Knockout? EA: The excitement and energy of the room. 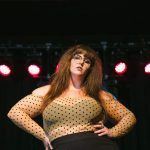 An entire audience of people watched women on stage who looked like them, wearing things that society has deemed “acceptable” only for certain body types, and the reception was wonderful and moving. The emotional response to people seeing themselves represented as beautiful and powerful was just so incredible, and we’re grateful that we got to be a part of that. 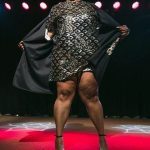 JH: Proud Mary is about giving plus-size people something that is bold and unapologetic. Whether that’s sheer, bright colors, metallics, etc., I want to allow people to wear things we aren’t “supposed to” wear. This collection, I amped up basic silhouettes with almost fantastical materials and prints. 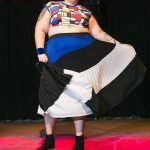 We [fat and plus-size people] deserve to have fun. BH: With indie fashion, managing supply can be tough! Will the pieces we saw on the runway be available to order? JH: All pieces are custom made and our own brand. They are limited but will be available online, and we will restock as needed/available. We will also be introducing some more pieces, so stay tuned! JH: I always love connecting in community spaces. I first became involved in the fat positive community almost 10 years ago. I started my brand because of my deep love for this community, and we got our start by planning pop ups. So an event where indie brands are the whole show is so powerful and amazing. BH: The velvet that you use in this collection is incredible! Where did inspiration for your collection come from? SF: I was really inspired by Ellery pre-fall 2017 collection. The colors were so rich and made me dream of fall weather. So it was just about warm colors, cool wear and comfort. BH: Did you make custom pieces for the models, or were the pieces ready made? Are these limited edition pieces (ie a set quantity) or will you be making them for the next few months? SF: All my pieces were custom made for each model and majority of the pieces will be available in limited quantity starting in November. SF: Knockout as a whole was just an amazing experience. It’s hard to pick one thing. But just having such a supportive community come out and support all of us indie brands, it just gives me all the good vibes and keeps pushing me to work harder and make more collections. So ladies, are you feeling these designers? Which was your favorite? What pieces are you looking forward to rocking the most? Thanks to Beth Olson Creative for photos. At the time of publishing, we were not able to interview ALLIHALLA, a sixth designer who showed at Knockout.